If money can’t buy happiness, can happiness get money? There are many homilies on whether or not money can buy happiness. But none posed the inverse question, until now. A reasonably solid longitudinal study (performed over a period of time by following the experimental subjects) suggests happiness might lead to better income potential. It finds people who described themselves as happier while growing up went on to earn more than those who weren’t happier. Here is the PDF link. When was it measured? – After all there are many studies from reputable consulting firms and academia that measure an attribute now and say all the past growth was due to that attribute. What about the effect of parents, more precisely genes on the earning potential? What are the other lurking variables here? All very good questions and these are posed and answered by the researchers except for the last one. They did a truly longitudinal study, starting at age 16 and studying income at age 29 for a large sample size. So it avoids hindsight bias and selective recall by participants. It also avoids survivorship bias in the results. Regarding the effect of parents, family and genes, they controlled for that by studying siblings. Among siblings, a one-point increase in life satisfaction at age 22, compared with the mean of the family, translated into a nearly $4,000 difference in earnings at age 29, compared with the family mean. Now that the four main questions are answered can we say categorically that it is not just mere correlation between happiness and income and happiness is the causation? Unfortunately not. What if there is another lurking variable that led to the respondents’ happiness that is also responsible for their income potential? But compared to most studies we see this one merits closer look. Here is an undeniable fact – considering ~50% of the population is women and 50% of the board of directors are not women, we can safely say women are underrepresented in corporate boards.Now let us return to the reported study in question that makes a faulty case for adding women board members. My arguments are only with errors in the research methods and its application of faulty logic. Nothing more. The study analyses the performance of close to 2,400 companies with and without board members from 2005 onwards. We can now see a much clearer inverse correlation (–0.65 and –0.76 for Europe and the USA respectively) between the relative share price performance of companies with one or more women on the board compared with those with no women on the board and the overall market. I see several issues with this type of analysis and subsequent argument attributing causation. Does the board matter? We are not talking company executives who actively set strategy and make operational decisions everyday. We are talking about the board that meets for a day or two, four to six times a year and in most situations are not the experts in the vertical the company operates in. Do boards really have a role to play in a company’s stock performance? Some of the previous works on this topic found no contribution by the boards in a company’s strategy or stock growth. I am yet to see a report that looked at percentage of changes in stock price that can be attributed to the board. Leap from Correlation to Causation First the report found a correlation in stock performance then it goes on to provide seven reasons on why the gender diversity is helping stock performance. The implied statement here is, women board members were the reason for stock performance, let us tell you why they made the difference. That is an untenable leap from correlation to causation. It buries us with plausible narratives on how women board members would have made the difference without telling us how it can draw the causation argument. Flaw of averages The study compared average stock performance of the two groups. Not pairwise comparison and not frequency comparison. Averages hide lots of detail. Take for instance Apple and S&P 500. While S&P 500 is down 13% from its 2007 highs, without Apple it would have been down addition 2%. What about such big movers in the two groups that disproportionately affect the averages? If we take them out, what would the performance difference look like? Not asking why some corporations seek diversity in boards Isn’t the question here, what type of corporations would seek to strengthen its board and seek to add diversity (not just demographics but ideas too) to help it perform better? Such a corporation is likely already doing many things right that is contributing to its performance. Attributing its performance to appointing women directors is confusing the cause. For those interested, there is indeed one women member, Andrea Jung (ex-AVON chief) in Apple board. Can one attribute any part of Apple’s stock performance to Andrea Jung? Since Sheryl Sandberg was appointed to Facebook board their stock has taken a turn for the worse, can one attribute causation to the appointment? Seth Godin had runaway success with the KickStarter project for his book. His stated goal was $40,000, but the project reached that goal in little over two hours of its launch. The total, at last check, stands at $256,691 with two more weeks to go. Likely it will go on to add few more thousands before the final date. 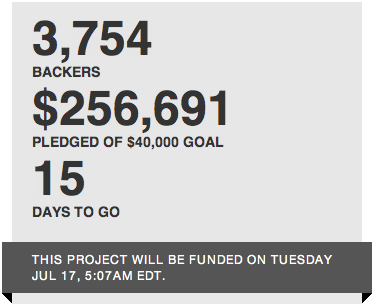 What does this success tell every aspiring writer who wants to use KickStarter as a way to self-publish their books? Godin neglects the fact that he is a popular published author, speaker, Idea Man and most importantly someone with thousands of loyal followers (who seem to have remarkable cognitive similarity). It is not a surprise that his first KickStarter project, launched through his extremely popular blog as marketing channel, became a tremendous success. He can thumb his nose at publishers seeking to control what we get to read. His success is irrelevant to the rest of us. Godin got the causation backwards. If you are already popular, have a sucessful publishing career, built an online following then you can translate that power to any channel. Not the other way. What is the base rate of success on KickStarter? According to their statistics page, 1,617 of 62,032 total projects reached their goal of $20K to $99K (picked this range to line up with the $40K target Godin set for his project). 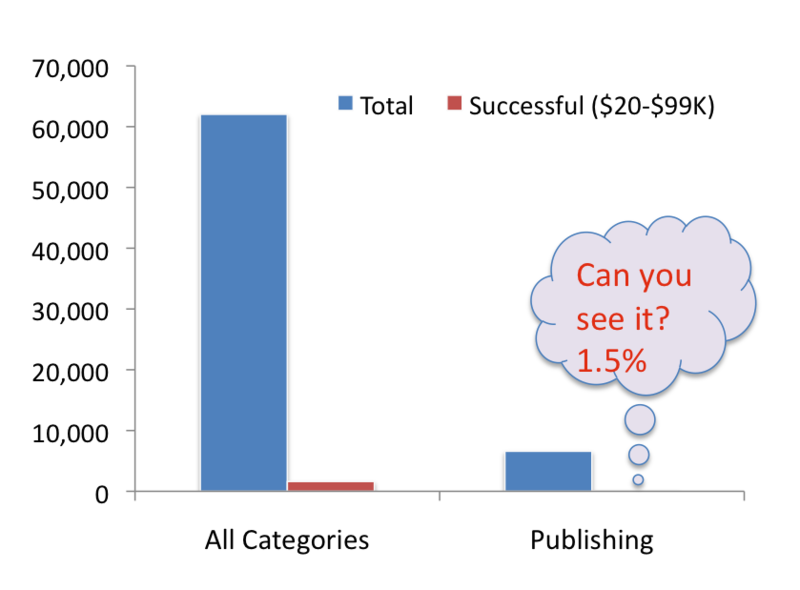 That is 2.6% of all projects secure funding that is big enough to provide career income to the author. But wait, that is the average across all projects. As an aspiring author who wants to “calmly” build a publishing career you should look at the success rate for Publishing projects. For this category the number drops to 1.5%. If you are not Seth Godin and you started a KickStarter Publishing project today, your chances of making your $20K-$99K target is no more than 1.5%. Getting successful funding for one book is one thing, turning that into a career is another. The chances go down quickly for repeat successes. It appears there is new found craze for regression analysis in tech blogs. Ok may be not, there was just this article and then another in Techcrunch. 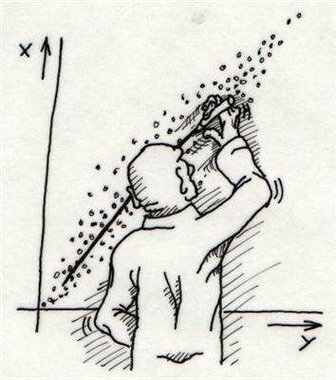 If you really want to understand and admire a fantastic use of regression analysis you should read this article by WSJ’s Number’s Guy, Carl Bialik. Carl’s hypothesis, a team’s winning percentage for the season must be highly correlated with its cumulative (for the season) margin of victory. Note that this is not a predictive model about next game nor about whether a team will have winning season. It is simply a model of expected Win percentage given the cumulative scores. No causation whatsoever is implied. Unlike the faulty model we saw, data already exist and not coded after the fact. How you would use the model? At mid-season you enter a team’s cumulative margin of victory (total points scored less total points against) and find the Win percentage suggested by the model. If the actual number is significantly lower than the one suggested by the model, as in the case of 2011 San Diego chargers, you look for explanations for the poor record. At the outset it signals wide variance in team’s performance – when they win, they win big and when they lose they lose the close ones. Then you look for reasons and fix them. This example is by far the best out there in correct usage of regression, which by definition means looking backwards. This model only looks backwards and it does not predict the future based on past events. And in doing so it treats regression for what it is, correlation and hence accounts for all kinds of biases. Next we see a news story attributing clear causation. This one is hard to notice for some as it appears to be longitudinal – reported over six month period. If it were a simpler cross-sectional study most will catch the fallacy right away. First let me point out this is the problem with data mining – digging for nuggets in mountains of Big Data without an initial hypothesis and finding such causations. Second school rating improvement could be due to random factors that coincide with lower foreclosure. Third despite the fact that longitudinal aspect implies causation there are many omitted variables here – the common factors that are driving down foreclosure and driving up school rating. School rating is not an independent metric. It relies not just on teacher performance but also on parents. The same people who are willing to work with their kids are also likely to be fiscally responsible. Another controversial but a proven factor is the effect of genes on children’s performance. Ignoring all these if we focus our resources on improving school ratings to solve foreclosure crisis, we will be chasing away the wolves that cause eclipses with loud noises. The traditional media and the social media are peppered with stories on how one can achieve success like other successful entities. Examples include, 7 habits, Good to Great, and numerous blog articles that follow the similar pattern. Almost all of these articles look at a successful business or a person and look for observable positive traits . Then they attribute the success to the presence of such positive traits. We can’t stop because the data fit an hypothesis, data can fit any number of hypotheses. Even if we set all these flaws aside and accept that indeed the success was the direct result of the positive traits there is another problem. These traits may be sufficient to the success but are they necessary? Take an extreme example (for illustration). Let us say you observe a tall person in a fruit orchard. You observe her effortlessly pick much more fruits than others thanks to her height which gives her access to more opportunities. Her height was sufficient to get more fruits, but was it necessary? Next time you see articles on “6/7/8/9 ways to do marketing/product-launches like Apple/Google/twitter/GratefulDead”, even if you look past the biases you should ask if the methods are relevant to your situation and are indeed necessary for your success.